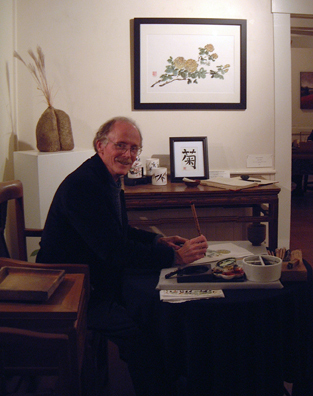 Bruce Iverson is an artist who has specialized in Asian Brush Painting (sumi-e in Japan) since 1972 and has studied with master brush painters Jean Shen, Ning Yeh, and I-Hsiung Ju. He has exhibited in group and juried shows throughout the United States and has had several one-man shows in New England and in Chicago. He has traveled in China to study and gain a deeper understanding of the context of brush painting. His work is grounded in a three thousand year old tradition in which the tools, techniques and philosophy of this Asian art form have had lifelong resonance. Bruce teaches brush painting workshops and classes at various venues including the River Gallery School/ Brattleboro (VT), Newburyport Art Association (MA), Fairchild Botanic Garden (FL), Chicago Botanic Garden (IL), and the Currier Museum of Art/ Manchester (NH).